At "Crescent Point" we offer you a warm welcome to our modern sunny home and over breakfast, panoramic views of Wellington harbour to the city and beyond. There are two lovely suites available (with beautiful linen and bathrobes) one Cream Room with ensuite bathroom, free wi-fi and views of Wellington harbour, and the other (Green Room) is self-contained with private bathroom, kitchenette, own entrance and carpark. We have lift access with no steps from the front carpark which goes down to both rooms. We are child-friendly and do have a cat. We are happy to help you enjoy your stay with information about what’s happening in Wellington, help with ongoing travel and perhaps assistance in booking shows or restaurants. 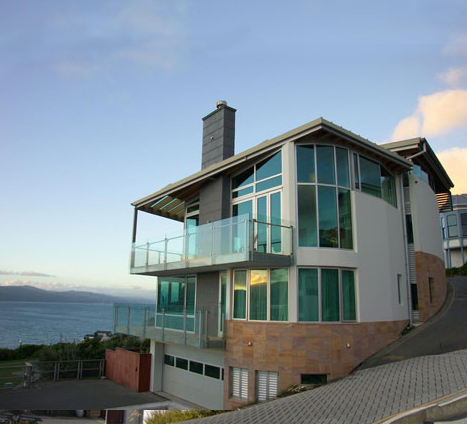 We reside on the point overlooking Oriental Bay with a lovely 15 minute walk down through the bush to the bay and thence to the entertainment and nightlife end of Wellington city. Then it is 15 minutes to the airport or 20 minutes to the ferry to the South Island. Add cable TV, Internet access and watching the exciting and ever-changing weather scene and you will be assured of a memorable stay here at ”Crescent Point” in Roseneath, Wellington. Please use the directions on this page for the shortest route to our Bed and Breakfast as Google map directions take you the long way round. Crescent Point B&B is a member of the "Bed & Breakfast Association NEW ZEALAND" - THE B&B Association for Quality Assessed Accommodations.